Goodreads is an independent online community for book lovers, with a powerful, Netflix-like recommendation engine helping you find new and interesting books to read. Goodreads is similar to the Amazon-owned Shelfari community in that it is all about books, but it offers a very different take on the subject--so much so, that you might want to keep accounts on both websites. Membership is required, but free. A Goodreads recommendation list looks almost exactly like a Netflix recommendation list, just for books. To use the Goodreads website, you must first select your favorite genres from a long list, which oddly enough includes "eBooks", even though that is not a genre. Then, to prime the site's recommendation engine, you are asked to rate 20 books, with a selection shown from each genre you picked. It also asks your permission to search for your friends in social networks, but that is optional. When you rate a book favorably at Goodreads, the site pops open a short list of books similar to it. When I liked Extremely Loud & Incredibly Close, Goodreads suggested The Amazing Adventures of Kavalier and Clay, a book that I indeed want to read. Other recommendations felt similarly accurate. Much like in Netflix, you can mark a book as "want to read," rate it (only if you already read it), or click "Not interested," which is a tiny link under the rating stars. Rating a book or adding it to your wishlist is a simple, one-click affair. This is very different from Shelfari, where adding a book to your collection opens a multi-step wizard that can take a couple of minutes to step through. Once you've rated 20 books, you can access your personalized Goodreads recommendation list. The list shows five books from each of your genres, with a link for more. When you hover over a recommendation, Goodreads shows you why it was picked, as well as its publication date, a synopsis, a star rating, and how many people rated the book (a number that's usually in the thousands, indicative of an active community). Like Shelfari, Goodreads uses a "shelves" metaphor, but here it's just a fancy name for a list or a grid of cover thumbnails. Another point of similarity is that Goodreads can search for fellow Goodreads users amongst you contacts on Twitter, Facebook, Gmail and more, but the site is very useful even with no social context. 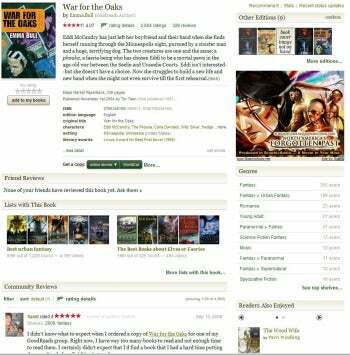 Individual listings on Goodreads don't show much metadata, focusing on reader reviews instead. Goodreads' individual book listings are a far cry from Shelfari's encyclopedic, metadata-rich listings. Details such as characters and locations are hidden under a tiny "more details" link, which is also used to reveal the complete synopsis. There are quotes, sorted by how many people liked them, but with no attribution to the character in the book that said them. Goodreads sets reader reviews front and center. Each book listing is basically a collection of reviews, with an Amazon-like breakdown showing how many reviewers gave the book each star rating, so you can see what its average rating is composed of. You can "like" a review, but you can't "dislike" it or mark it "not helpful." You can also comment on a review, much like in Amazon. You can access a "Stats" view for each book, which is a chart showing how many people added the book to their shelves over time, rated it, reviewed it, and marked it as "to read". This makes for an interesting gauge of a book's popularity and life cycle, but data starts on August 2011, so the time span is a bit too short for making any conclusions. There's also "Get a copy" button that lets you search for the book on Amazon, B&N, Kobo, Half.com, and several other likely sources. Book Depository, a store offering free international shipping on every order, is sadly missing. There is also a price comparison engine that didn't work for me (it came up blank). Next to it is a button leading to WorldCat, a website that lets you check if a local library happens to have this title in stock. Authors have their own pages, and some authors even maintain blogs on the site. Others, such as Terry Pratchett, blog elsewhere, and Goodreads pulls in the feeds from their site and displays their recent blog posts on the author page. Clicking the subject line of a post leads to a scraped copy of the post, which is sometimes a bit broken (like this post from Pratchett, which shows anchor tags along the bottom). Worse still, Goodreads readers can comment right on that page, perhaps thinking that their comment will reach the author. The right thing to do would be to link from the RSS feed directly to the blog, so users can comment there--much like Google Reader does. Scraping shenanigans aside, Goodreads offers a strong and compelling recommendation engine, making it a better source for future reading material than Shelfari. So for learning more about a book, go with Shelfari. To find books to read, I recommend Goodreads. Note: The Download button takes you to the vendor's site, where you can sign up for an account and use the free service. 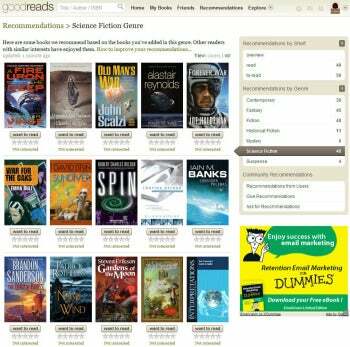 Goodreads uses a powerful recommendation engine to help you find books you'll like.